Given their son’s artistic aptitude, Pierre and Marguerite Delvincourt entrusted him to Léon Boëllmann, then to Henri Büsser. In February 1897, the little prodigy was honored to play at the Château de Peles in Sinaïa before Carmen Sylva, the Queen of Romania. He soon tried his inexperienced hand at writing short occasional pieces. Georges Falkenberg taught him the piano as of 1902. At the Music Conservatory of Paris he joined the class of Georges Caussade for counterpoint and fugue in 1906, and two years later the composition class of Charles-Marie Widor, while at the same time obtaining his law degree at the university and preparing for the Ecole Polytechnique, since it was of utmost importance to follow his father’s diplomatic career. At The Hague in March 1907 he completed a Sonata for violin and piano. A Quintet for strings and piano and a Trio with piano dating from that period are still unpublished. His youthful works give outrageous prominence to the keyboard over the other instruments. Their structure is always tinged with the humor shared by his person and his music. The first part of the sonata in G minor introduces two themes in succession; one is a solemn march and the other rhythmic and bouncy;. They alternate throughout the movement in various forms. The key of C sharp gives color to the poignant Lamentoso, followed by an ostinato, spelled in sixteenth notes, enters quietly in the bass (this tribachys [of three even beats] can be linked to the violinistic phrase of the Allegro moderato). Meanwhile the subject, with its characteristic triplet formed in the first movement, unfolds. The part allotted to the violin, although rather simple, is witness to the relative lack of familiarity of the young musician with the resources of this instrument. In contrast, the exuberant “pianism” is to be attributed to the virtuosity of Alkan. The Sonata was submitted a little later for a reading by his Conservatory classmate, the violinist Hélène Morhange who wrote: “One of the first composers who came to see me, brought by my friend Paul Paray, was Claude Delvincourt; very young, blond and charming, he seemed to hunger for music. […] The day I met Delvincourt, I worked through his Sonata and he asked me to play it at his place, avenue Mozart, for a musical soirée organized by his parents. This Sonata, with its very beautiful inspiration, already contained in essence all of his future music”. 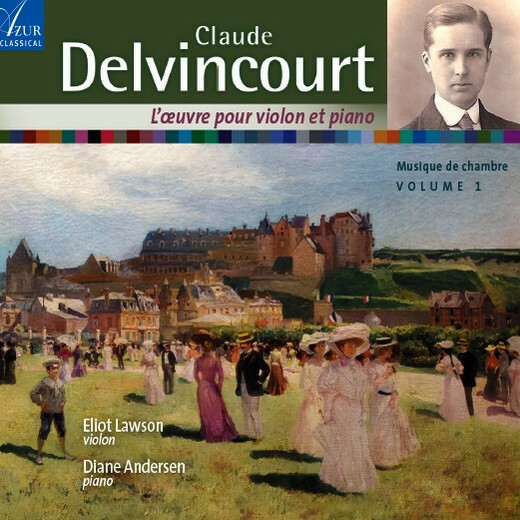 In 1913, Delvincourt was awarded the Premier Grand Prix de Rome, just as did Lili Boulanger, whom he helped secretly to finish the orchestration of her Cantata. The dazzle of Italy was from then on to mix with the tradition of France. Among his works sent from Rome there appeared L’Offrande à Siva, a Hindu ballet with bright colors, the symphonic poem Typhaon, and the Radio-Sérénade. He was happily emancipating himself from the reigning influence of the academy when the war interrupted his stay at the villa Medicis. Although deemed physically unsuited for military service, he signed on as a volunteer for the infantry. Severely injured on the Argonne front on December 1915, he went back to composing only after a long convalescence. The sequels of a body mangled by shell fragments would cause much suffering during the rest of his life. While the Six Poems of Maurice d’Assier, conceived before the war, still show the mark of a composer searching for his personality, the admirable Sonata for Violin and Piano (1919) immediately lays claim to being one of the best and most personal modern works in this genre. It mirrors as much the stigmata of the war as the signs of a radical mutation. The first movement opens with a somber meditation in D minor (a key often associated with death: Mozart’s Requiem or Death and the Maiden by Schubert). As if wandering after a long spell of numbness, the discourse seems to hesitate between several directions. The first idea presents itself in varied guises. The development progresses in a quasi-rhapsodic fashion and falls into a sonata format, by its new complexity introducing a reflection on the classical form. An ambiguous F sharp adds color to the second movement, “Vif et gai”. This scherzo displays a recitative inspired by popular song; then its vehement rhythm once again attains the ardor and enthusiasm characteristic of its composer. It explores all sorts of keys and terminates oddly on the dominant of C sharp major. The last two movements follow: a mysterious dreamy Andante entices by its enigmatic polytonal ambiance, its poignant accents softly suggested, out of this world. The finale abruptly interrupts this dream and sweeps it all along in an abundance of warm sonorities and an irresistible momentum imbued with a scratchy mockery in the style of Shostakovich. It all ends with an unforeseen yet peaceful return to the initial theme in D minor. This work was first played on February 26, 1929, at the S.M.I. by Jeanne Leleu and Jeanne Zimmermann and was immediately praised in reviews in the music press. Appointed Director of the Versailles Conservatory in 1932, Delvincourt brought to it a new dynamism. He organized chamber music concerts. His comic opera La Femme à Barbe (1938) played at the Montansier theatre. He also composed the music for several movies (La Croisière jaune, L’Appel du silence, Brazza, Sœurs d’Armes). His famous Suites, imbued with Italian refinements and dance forms inherited from the 17th century, continue the tradition of Ravel: Radio-Sérénade (1914), Boccacerie (1922), portraits from the Decameron, the caustic Croquembouches (1926), and the Bal vénitien (1927). His music became more and more audacious. The facetious Danceries (1934), dedicated to his violinist friends, overflow with vitality and unbridled fantasy and remind us how much the circus and music hall ambiance attracted composers between the two wars. A rapid Ronde in G major opens the collection, followed by a Bourrée with surprising changes in pitch. The Basquaise (D minor) scintillates with lightness. The supple Louisiane in G major confirms his profound knowledge of Black American music, which already informed the swing style of the “Black in a shirt” of the Croquembouches. An astounding Farandole concludes with good humor in C major. This verve links him directly to Chabrier. A final piece for violin and piano, Contemplation (1935), presents a chant in B flat with oriental overtones that shimmers with modal ambiguity. All in half tints and with few means, Delvincourt reveals himself a refined master of the miniature (Heures Juvéniles, Ce monde de rosée, …). His predilection for popular song and the Middle Ages shows in Chansons de la ville et des champs (1933), Four Chansons de Clément Marot (1935), and Images pour les Contes du temps passé (1936). Promoted to Director of the Paris Conservatory of Music in 1941, he kept himself “very close to his colleagues and his students; he is their confidant, their friend, while maintaining the necessary authority. He knows how to communicate his happy dynamism to the people around him and instills in them his enthusiasm and his faith in music”. At the end of 1942, Delvincourt worried: “I have sad news: conservatory students are being selected to be forced into service in Germany. I must prevent this at all costs. There are only two threatened so far, but if I let them go a hundred will be taken”. Helped by Jacques Chailley, ”I am moving heaven and earth to prevent it”. He considered his students as an elite able to maintain the prestige and the artistic influence of France. He created The Cadets Orchestra and Choir for the purpose of protecting them from Obligatory Work Service (STO). In fact, this group composed of eighty musicians and a choral group of fifty students soon became a symbol of the institution’s resistance, even if it had to obey the rules of the German occupants. Claude Delvincourt demonstrated unfailing determination. He did not hesitate an instant to rejoin the National Front of Musicians, organization of resistants to which belonged Marie-Louise Boëllmann, Roger Désormière, Henri Dutilleux, Manuel Rosenthal, Elsa Barraine, and Irène Joachim. He wove “indissoluble friendly ties with those who had ferociously fought fascist movements”. Secret meetings were held at his home or at the Conservatory. When the German authorities found out this stratagem, he ordered the Cadets to disappear (many made their way to the FFI) and he himself hid at a Jewish friend’s house until the end of hostilities. Rarely has an establishment director shown so much complicity with his students. His actions were in all respects exemplary at the head of this establishment that he had reformed and whose teaching he had modernized. Awarded the Croix de Guerre with Palms and the Military Medal and in 1933, made Chevalier de la Légion d’Honneur, Claude Delvincout was restored to his position in 1944 at the Libération and upgraded to Officier de la Légion d’Honneur. The Paris Opéra presented his mystery Lucifer (after Byron) in 1948: a vocal quartet in the pit took the place of a narrator and the choirs were placed on either side of the orchestra. Claude Delvincourt, thinking of his retirement, was happily contemplating returning to his own work. A Concerto pour piano was in the works. Death caught up with him at the wheel of his car at Orbetello on April 5, 1954, and he never heard his Quatuor à cordes which was first played a few hours later at the XXth Century Festival in Rome. “French music has lost in him one of the best of his generation, one whose solid formation and generous, spontaneous, and ardent nature brought honor to our profession”.